Rookies are on display in 2011 Topps Platinum Football, a set that emphasizes a deep checklist of first-year autographs and shiny goodness. Multiple levels of Refractors will keep player and team collectors busy. With so many rookies, autograph and patch combinations, regular veteran base sets should be somewhat easy to track down and complete. The plethora of patch cards will lead to many attractive pieces, however it should be noted that Topps is listing the rookie patches as being player-worn, while veterans are game-used. While the timing of the set's release should tip collectors off that the rookie pieces aren't game-used, it's smart to remember this going in and set their value expectations accordingly. Two on-card Autograph Rookie Refractors. One Autograph Refractor Patch Card. 50 different on-card rookie autographs (two per box). 50 different rookie cards featuring Refractor technology (one per pack). 35 different rookie autograph Patch Cards featuring a multi-color swatch (one per box). Jumbo Patch Refractor rookie autographs. 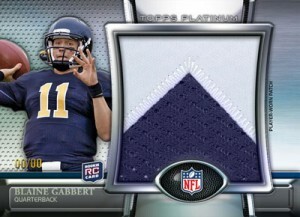 25 different Platinum Die Cut Cards (hobby exclusive, one per box). Dual rookie autograph Refractors (/25). Triple rookie autograph Refractors (/10, hobby only). Hexagraphs featuring six rookie signatures on a double-sided card (/10, hobby only). Refractor (/50), Gold Refractor (/10), Printing Plates (hobby only), Super Refractor (one-of-one, hobby only). Dual rookie autograph Patch Refractors (/25). 30 autograph Platinum Patch Cards - 25 veterans and five rookies featured on an over-sized swatch (/5, hobby only). Rookie autograph Patch Card parallels: Green Refractor (/199), Blue Refractor (/99), White Refractor (/25), Gold Refractor (/10), Superfractor (one-of-one, hobby only), Red Refractor NFL Shield Patch (one-of-one, hobby only). 15 veteran autograph patch Refractor cards. Veteran autograph patch Refractor parallels: White Refractor (/25), Gold Refractor (/10), Superfractor (one-of-one, hobby only). 35 Platinum Rookie Patch Cards featuring colorful, supreme-sized patch swatches. Each of these hobby-exclusive cards are serial numbered (one per 12-box case). 100 veteran base cards (four per pack). Veteran parallels: Gold (1:5 packs), Emerald (1:10 packs), Ruby (1:20 packs). Rookie parallels: X-Fractor (1:4 packs), Green Refractor (/499), Blue Refractor (/299), White Refractor (/99), Gold Refractor (/50), Red Refractor (/25), Printing Plates (hobby exclusive), Superfractor (one-of-one, hobby only). 2011 Topps Platinum Factory Sealed Football Hobby Box Cam Newton AUTO RC? I like Topps Platinum. Sharp looking cards. Lot of Variations. Affordable price. And for those lucky folks…..some genuine treasures. 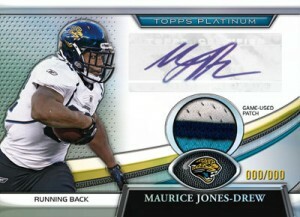 Love this product however I noticed that you have listed the White Rookie patches as numbered to /25. they are in fact purple refractor patches that are numbered to /25. 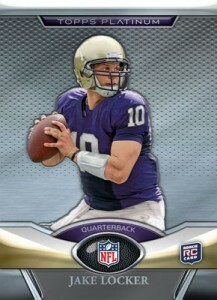 I have not seen a white refractor as of yet in this product.